Our eyes are ten times more sensitive to UV light than our skin and children’s eyes are at the greatest risk of UV damage. Because children have big pupils and clearer lenses inside the eye, this means that up to 70% more UV light reaches the retina than in an adult’s eye. This makes it especially important for kids to protect their eyes from the sun. 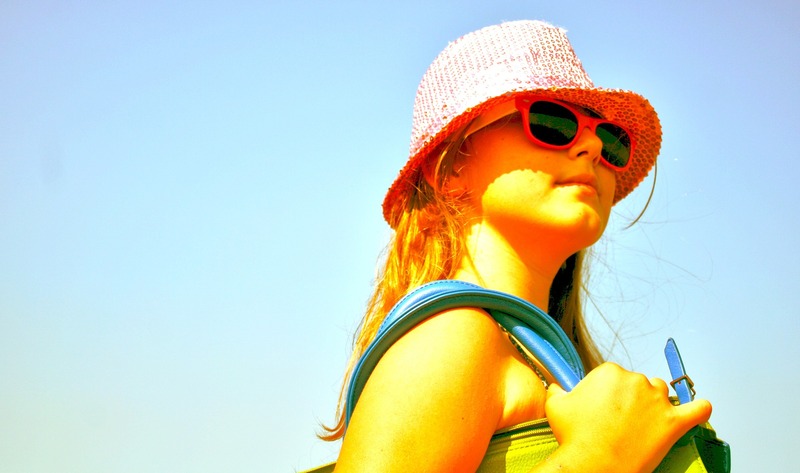 Experts say nearly 50% (or more) of our lifetime exposure to UV rays may occur by the age of 18, as many children spend significantly more time outdoors than when we be come adults. Brimmed hats and sun-shades attached to prams and pushchairs will generally provide adequate protection for babies and very young children. Children’s sunglasses should always carry the European Standard CE mark or the British Standard BSEN 1836:1997 as this guarantees that the sunglasses offer a safe level of UV protection. ‘Toy’ sunglasses or those not providing at least 99% protection from UVA & UVB can actually cause more damage be-cause the tinted lenses dilate the pupil allowing more UV light to enter the eye. Although ultraviolet radiation is invisible to the human eye, most people are aware of the effects of UV through sunburn, and tanning beds. Most of mid-range ultraviolet is blocked by the ozone layer, and would cause much damage to living organisms if it penetrated the atmosphere. After atmospheric filtering, only about 3% of the total energy of sunlight at the zenith is ultraviolet, and much of this is near-ultraviolet that does not cause sunburn. An even smaller fraction is responsible for sunburn and also the beneficial formation of vitamin D. So the UV spectrum has many effects, both beneficial and damaging, on human health such as eyes. High intensities of UV light are hazardous to the eyes, and has been linked to damage, including cataracts, macular degeneration, pingueculae and pterygia and photokeratitis that can cause temporary vision loss. UV light is absorbed by molecules known as chromophores, which are present in the eye cells and tis¬sues. Chromophores absorb light energy from the various wavelengths at different rates — a pattern known as absorption spectrum. If too much UV light is absorbed, eye structures such as the cornea, the lens and the retina can be damaged. To protect your eyes from harmful solar radiation, sun glasses should block 100% of UV rays. Frames with a close-fitting wraparound style provide the best protection because they limit how much stray sunlight reaches your eyes from above and beyond the periphery of your sunglass lenses. Looking for a Children’s Eye Examination?